Model 442 machine engraved. 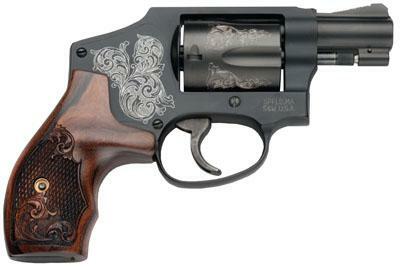 When you need a lightweight carry revolver, you turn to Smith & Wessons small frame airweight series. They are the original aluminum, small frame revolvers that have become the first choice for those who insist on an all steel small frame revolver with greater recoil and proven performance. Mahogany Presentation Case Included.